Hey folks, good news! 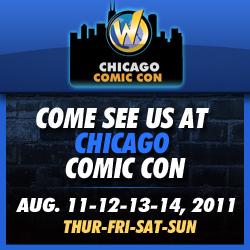 Sinister Design is going to have a booth at this year’s Chicago Comic Con! We’ll be at table 3835. Make sure to come by and say hello! This entry was posted on Tuesday, August 2nd, 2011 at 8:44 AM and is filed under Fan Stuff, Sinister Design News. This post is tagged convention appearances. You can follow any responses to this entry through the RSS 2.0 feed. leave a response or trackback from your own site.